So keep away from our elitist club, unworthy! 4-5 new disks not titles. He lists every disk as a separate entry (and the boxsets have a number as well). So he's got 6800+ DVDs not titles. what is the DVD Profiler Rekord? the Colleciton Record what is known? I'm however surprised that every single disc of a boxset, even for tv-series, are mentioned separately. I wonder if most DVD Profiler users do it like that or just see those as one single entry. I prefer to list each disc that way I can refer to DVD Profiler directly to see what disc has the episode I want to watch, should I be looking for a specific episode or what have you. After all what is the purpose of having a DVD Database if you don't make full use of what that Database allows? 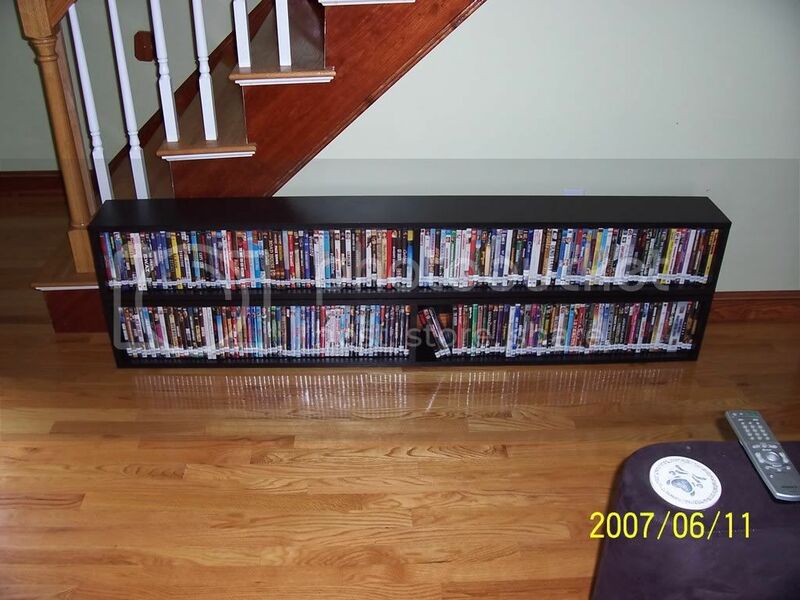 probably not the right spot to ask, but would love to see how you store those 4000+ DVDs!!! Can't show you how I store a ton of DVD's, I only have about 1500 discs currently which isn't up to the 4000 of others but it's still a storage nightmare. I thought about using sleeves but frankly that idea never appealed to me and made cataloging to keep track of what binder a movie or series is in. My solution was to move my collection to thinpaks and multi disc boxes. For example I have 36 Woody Allen movies, or will have as I pick up the last 5 or so movies still on my want list, I have moved those into 3 12-disc cases. Since Each 12-Disc case takes a little less space than 3 normal DVD cases you can see that over the span those 3 12-disc cases take the room of only 8 Regular DVD cases, or a savings of around 80% of shelf space for the collection. 4-Disc cases take the same space as 1 Regular dvd case so you still keep a 75% reduction in shelf space moving singles to 4-disc cases. 1) Huge savings on shelf space. 2) By making logical collections (aka putting movie series together, actor or director series, or making special collections like classic sci-fi collections etc,) it makes it possible to still maintain an ordered collection which makes it easy to find the title or disc your looking for. 4) with custom covers printed for the boxes they can look extremely sharp on your shelf, moreso than the originals in many cases IMHO. 1) it's abit pricey to rebox huge collections, It'll cost me around 150.00 in new cases when all is said and done, maybe 200.00. (but when you think about it that's not really much more than buying a new dvd cabinet. 3) It's time consuming and a minor expense to print new covers..not to mention the time to create the covers or locate acceptable covers on the internet (in my case I design my own). Answer to questions have ask or pondered. Why do I collect things, because I can, it keeps me off the streets. I do go to an occasional sporting event with friends. Phoenix is one of the few areas with all four major sports. Thanks to the computer industry, I’ve been about every place I wanted go and don’t care to go again. I used to have jeep all set up for off road and I traveled all over taking pictures of the scenic West, where many of the westerns were filmed. Now road to all the lakes are paved and to many people. How do I store all the DVDs? One room is setup like a library. Another setup with the computer. I have 21 Boltz multi-media storage racks, 42 feet, each rack holds 252 keep cases, another room book cases for the odd sized sets. Plus 2 Bolts cd racks, 600 cds each that takes care of classical collection. The jazz cds are all in boxes since they have been copied on an external hard drive on my pc, all 6650 tracks. The recent large jump profile numbers was due a request to create child profiles so Ken could get a read more on disc IDs. I have been expanding the profiles as they come available or I enter them myself when I have the time. Also a number of etailors started to have more sales and TV series sales expanded. Once the DVDs availability expanded, I seldom if ever buy from local stores. No sales tax, convenience, right to my door, or the time it takes to sort or find what I want. I still don't watch much TV, had cable when it first came out, decades ago, it was a pain. I get all the local TV stations in HD. I'd rather watch TV series on DVD, it's more convenient. I just found someone in the posts here with 11,000 titles !!!!!!!!!!!!!!! I looked at this collection. Very Good! Zoowie! And I thought I had a big one at 2300! As of right now, I'm up to 4246 titles. Although I am conservative when it comes to the numbering, so I only number titles, and not discs. I think I have a lot at 398 numbered DVDs and I don't number my box sets nor do I separate the disks out. So my total number is 469. I'm finding it hard to store what I have as it is. This weekend I was out browsing in an unfinished furniture store and found these "crates" for about 5 bucks each. Decided that they weren't exactly the right size for DVDs so I went to Home Depot and bought some wood and started making my own "cubes" they are about 8" high and about 6ft long. I have made 2 of these and will make others of varying lengths to take advantage of a particular wall. I plan to prime and paint them black. I wanted something somewhat modular so that they would be easy to relocate/add on to for future expansion. I hate buying a bookcase and then can't find another one to match it, drives me nuts. When they are done I will snap a few pics and send them along. Well I finished 2 of the units. They each hold about 122 DVDs. They are 6ft long by 8" high and 8" deep with just single 1X3 across the back. I'm at 4254.. I bought 400 dvds in 3 months. I'm officially OUT of the 4,000 club, culled 700 DVD's in the last three months and now stand at 3,629, although I think I've a few more to ditch in the coming month.